Most of the readers are quite familiar with the textbook concept of doubling time. 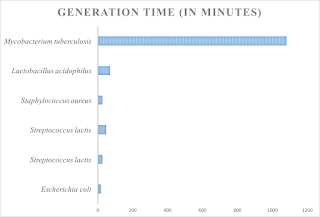 Perhaps the best known example is E coli with a generation time of about 20 min. But how far a bacteria can push. Can it be anymore faster? Scientists have worked out the thermodynamic limitations of a bacterial cell division (Link). The model basically implies that theoretically, E coli has a potential to push its doubling time further but it is already in its best possible practical limits. 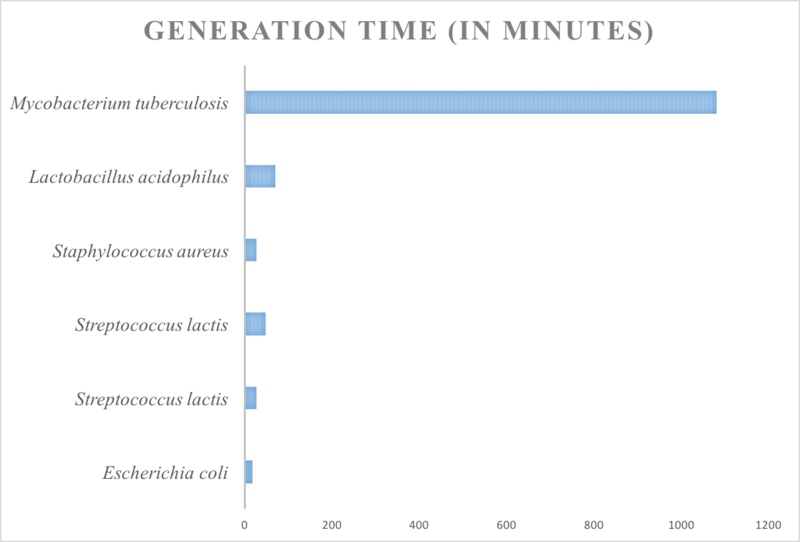 Fig 1: Comparison of Generation time of various bacteria. In a recently published blog post by Elio, which does a great job of explaining bacterial generation time, there is a mention of E coli strain which can double at about 12.5 min. Another bacterium Vibrio natriegens, is probably the real fast one with a generation time of less than 10 min. The strain DSMZ 759 takes approximately 9.8 minutes. There is also mention of 7 min as a time under particular conditions for this species. That is an incredible speed. See Fig 1 for a general comparison of doubling time in different well-studied species (The comparison is generalised for a species, since strain variations are known). On the other side of the spectrum, there is M leprae with the longest known generation time of about 14 days (Compare that with Mycobacterium tuberculosis for which it is about 18 hours). Before I go further down the discussion, let me first talk about basics of Bacterial growth curve. Everyone is familiar with the curve shown in Fig 2, so let me be very brief. Growth has a different meaning in different context. Growth can mean an increase in cell size or cell numbers. Historically for studies on bacteria, it was not convenient to investigate the growth and reproduction of individual microorganisms because of their small size. The concept is an average value for the population, and therefore we deal with the total population number. So it's important to note that the demarcations are not absolute. Not every cell is in “Lag” in lag phase and not every cell is replicating in log phase. You have to take it as an average of the majority. Before I go down further, I want to digress on a point which I think is an important distinction to make. What is the distinction between binary fission and eukaryotic cell division? In Binary fission, other than the fact that there is no true nucleus for “nuclear events” of division, the cell division ensures equal distribution of chromosome contents only. Binary fission in bacteria doesn't control for cytoplasmic contents to be equally divided between daughter cells. For example, one of the daughters may or may not receive all the plasmid copies from its parent cells. In sharp contrast, in eukaryotic cell division every component of the cell (nucleus and cytoplasmic contents), is equally distributed between the daughter cells. The bacterial growth curve is a concept of pure batch culture and not continuous culture. In a batch culture (also known as a closed culture), the bacteria are grown in a medium and condition best suitable for its growth, without replenishment. There is a limitation for nutrients. In contrast, bacteria growing in continuous culture are continuously replenished with media and toxic contents removed regularly and hence the cells don’t shift to stationary phase. There is a very low number of the organism in the seed inoculum. When a bacterium is inoculated into a fresh culture medium there is no immediate cell division and an increase in cell number. The bacterium senses the presence of a large number of nutrients and potential to multiply. The time period is used to synthesise materials for building the cell. At this phase, there is no increase in cell number but the cell tends to increase in size and metabolism slowly adjusts to the new environment. The time period of lag phase is variable and depends on multiple factors including the culture medium in use, where is the inoculum obtained from. 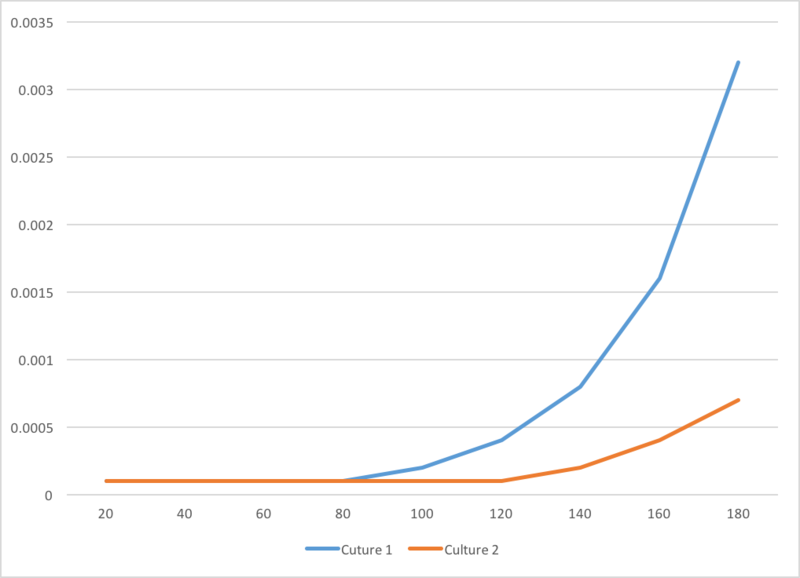 If the bacterial inoculum is obtained from the previous culture where the medium was similar and when it was in a log phase the lag phase will be very short (or may even be absent) since the cells are already adjusted and ready to replicate (Culture 1 in Fig 3). But if it's taken from a fragile state and the cells are damaged it will take some time for the cell to adjust and the lag phase will be longer (Culture 2 in Fig 3). Once the cells are ready for replication they start dividing rapidly. At this time, the cells have no limitations placed and are primed for the division at the fastest rate possible. The peak performance of every cell is at the best possible rate and hence most cells are uniform in terms of their physiology and biochemistry. All biochemical assays, antibiotic sensitivity assays performed in routine diagnostics is tested in this phase. This phase represents the best possible doubling time for a bacterial cell and doubling time is calculated in this phase. 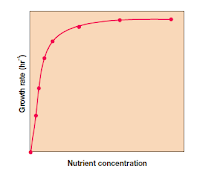 By increasing the concentration of nutrients we can increase the doubling rate. 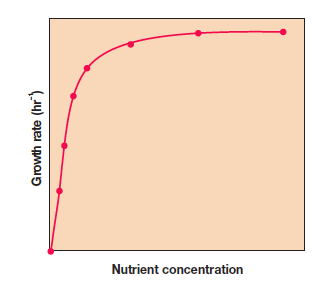 If we plot a graph (Nutrient concentration vs growth rate) we can see that it’s a hyperbolic curve (See Fig 4). At a very high nutrient level, the transport systems are saturated, and the growth rate just cannot rise any further. I want to make an interesting example of E coli to illustrate how the speed of replication is enhanced. In E. coli, DNA replication starts at a unique site (called as OriC) and replicates through a mechanism called as theta replication. The E coli genome is roughly 4.8 × 106 bp genome. It is theoretically estimated that one round of complete DNA replication requires roughly 36-38 minutes to complete in E coli. But E coli can double in less than 20 min. The trick is that as the daughter DNA strand is synthesised a granddaughter DNA is synthesised simultaneously (by using daughter DNA as a template) which is catching up. By the time the E coli cells divide, their DNA is almost doubled and ready for the division again. The cell numbers have divided rapidly and reached a peak at this stage. The cell number has usually increased by about 6-9 fold (Depending on conditions and strain). At this phase, the total number of viable cells roughly remains the same throughout. This is maybe because the cells cease to divide or number of cells dying is roughly equal to the number of cells being formed. In stationary phase, bacterial cells are unusually resistant to many different chemicals. The bacterium often shows shrinkage and nucleoid condensation. Bacteria also produce proteins called as starvation proteins which make the cell much more resistant to damage. For example, The Dps (DNA-binding protein from starved cells) protein protects DNA. There is some evidence that certain pathogens at least (such as S Typhimurium) express more virulent genes in stationary phase. The bacteria have virtually exhausted everything that medium had and the culture medium has become unfavourable for growth. The cells start dying at this phase. 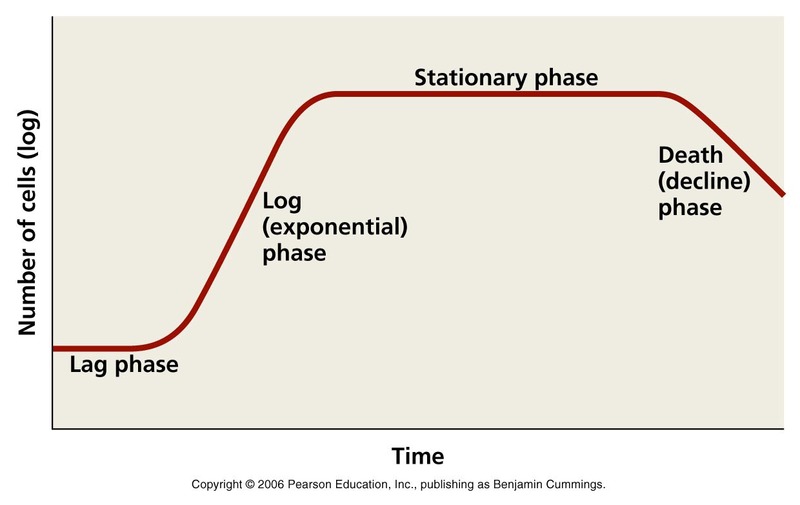 Interestingly, the phase is not a steep curve but rather follows a complex log scale. A majority of the microbial population dies in a logarithmic fashion, the death rate decreases after the population has been drastically reduced. This is most probably due to the resistance offered by persistent cells. In bacteria with the ability for spore formation, spore formation begins with the end of the stationary phase and in the decline phase, is mostly left with spores. Now coming to some real world questions. What phase are bacteria in when it is in a host? The answer is not straightforward for a couple of reasons. The host represents an unlimited nutrition supply at the bacterial scale, but host also fights the bacteria and hence there are significant inhibitions to achieving a log phase. It has often been quoted that T pallidum pallidum has a doubling time of about 33 hours. However, this is based on growth in Rabbit testes (Not ideal since the host is involved in the dynamics) and I would want to cast my doubt on how accurate that is. Second question, What is the limit of bacterial doubling time in terms of speed? In other words, how fast could a bacteria divide? There are theoretical projections that we could design something to be about 4 min max. I'm not sure of if any lab has achieved this. One proposed way of doing it is to artificially engineer a cell with as much reduced genome as possible. Craig Venters Lab, has already created an artificial cell called as Syn3.0. Syn3 contains a synthetic genome inserted into Mycoplasma which on its own was able to grow and live like a normal cell. The cell carries a total of 473 genes (of which function of 149 essential genes is unknown). Syn3 has a doubling time of roughly 3 hours in ideal conditions which is far high for an organism with just so few DNA. Very large genome organisms can have a quick replication time. So it is not logical to conclude that DNA length is the rate limiting step. A more logical idea is to include DNA polymerases that are known to be having faster addition rate are included in the genome with more origins of replication included, that would do the trick. For now, 7 min appears to be the fastest.